Every Day You Wait Is Money You Waste! With rates as low as 3.99% (with a 12 year agreement), financing customers can take a $250 electric power bill and turn it into a $150 solar system payment. Because it's 100% renewable, solar power is a proven money saving solution for both residential and commercial locations around the globe. Hi there! 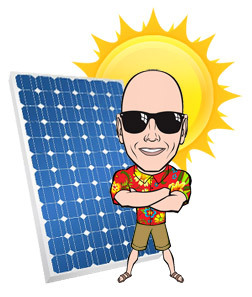 I want to personally thank you for visiting the Solar Innovations website. My team and I strive to provide cost effective solar energy solutions to help you capitalize on the world's leading renewable source of power: The Sun! While we offer new products and complete solar energy systems installation through our licensed solar installation partner, we specialize in reconditioned components and systems that provide the same electrical output as new systems for a fraction of the cost. The savings are passed onto our customers along with a priceless amount of information about each solar system, device or component we sell. I invite you to contact us with any question you have or to discuss a solar related project. The Dandy 2000 is a portable solar generator built by Solar Innovations using ISO 9001 and/or CE certified components. The Dandy 2000 is a 2,000 Watt continuous (4,000 Watt peak) Portable Solar Power Generator equipped with a (1) 150 Watt Grade A Solar Panel and (2) AGM batteries for double the power capacity than solar generators that only use (1) battery. Reason #1: Solar energy is abundant and renewable. Reason #2: Thanks to technological advances in solar panel and inverter manufacturing, solar systems are more affordable than EVER! Reason #3: A solar system will SAVE YOU THOUSANDS OF DOLLARS over time.